The Eglise St Trophime in the city of Arles, France in Europe is a popular tourist attraction when visiting Arles. The Eglise St Trophime was constructed in the 11th and 12th centuries and is one of several major sites of interest in the historic Roman city of Arles, France in Europe. 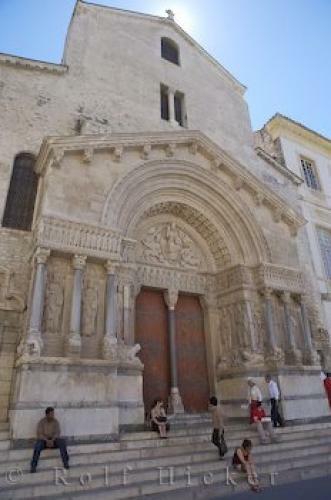 The Eglise St Trophime was classified as a UNESCO World Heritage Site in 1981 and is very characteristic of Provencal Romanesque architecture.In the front of the main door the patron saints of the Arles church are represented in their notable positions. Many restorations have taken place in recent years and have made the quality and beauty of Eglise St Trophime in Arles even more unmistakable.The Eglise St Trophime is a fascinating church and is open daily from 8:30 am to 6:30 pm for anyone wishing to attend church or to just have a look around at the amazing architecture or learn more about the history of this ancient building.Eglise St Trophime in Place de la Republique, Old Town, Arles, Bouches du Rhone, Provence, France, Europe. the city of Arles, France in Europe.